Racer X Asylum - View topic - Has Paul Gilbert abandoned the PGM series? 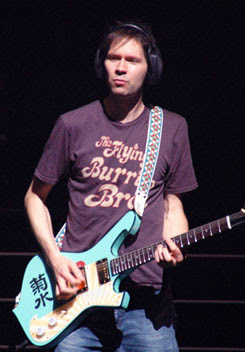 Has Paul Gilbert abandoned the PGM series? Rumor has it the entire Fuzz Universe cd was done solely with the Fireman. Do you think PG is done with the PGM series as a regular recording and live guitar? If so, do you feel, as most of us have more than one PGM, betrayed by such a move? Re: Has Paul Gilbert abandoned the PGM series? That isn't a rumor. Paul said in at least 2 interviews (one was in Japanese and translated very poorly - so this is a paraphrase!) that the entire album was recorded with Fireman models - the Bach Partita was done with the Kikusui humbucker model, and the other songs were done with single coils. Beyond that I have no idea - cannot help. I can source the quotes/URL's though if you need them. I would be very hesitant to say, based on one recording, what Paul is or is not doing, future-guitar-wise. He experiments and changes his gear lineup all the time. He's been known to record with non-Ibanez in the past... most recently, something on SFBADR - I forget what exactly (it had to do with the Sustainer pickup so it was probably Suite Modale)... and it never led to an abandonment. He was saying (Vintage Guitar interview IIRC) he fancied a Barney Kessel guitar (Gibson IIRC) and he hasn't abandoned Ibanez - not by a long shot. It's probably best to hold your fire and just see what happens... he's probably just tinkering with his tone / making his job more interesting / having fun! disclaimer: I could be wrong, and I don't own any PGM's. Well, everything changes over time. He played with pretty much the same looking guitars for like what, 20 years? I guess he just got tired of it already, just like mindless shredding, and he needed something new. The FRM supports Paul with a great tone so I'm thinking the change was good (unlike switching to Marshall imo). ummmm the Fireman is a PGM. if you have a fireman you say "i have a fireman" i cant imagine anyone with a fireman saying "i have a pgm"
Wellp. If there are no more PGMs, there better at least be some kind of release of the Orange PGM. Well, the headstock on my Fireman doesn't say PGM. well it is a PAUL GILBERT MODEL isnt it ? True but it doesn't mean much anymore. I think I'll sell the rest of my PGM's. Too bad the 301 I have on the 'bay is stuck at $1000. True but it doesn't mean much anymore. I think I'll sell the rest of my PGM's. there better at least be some kind of release of the Orange PGM. To be honest it's a case of different guitars for different things. I know Paul's said in the past that he believes there's at least one song in each guitar, due to the inspiration and the emotions brought about by each guitar. We know Paul got the red and blue Firemen recently, so maybe he was just inspired more to write on these guitars and used them for the record? I'm sure the regular PGM's will still have their place, maybe more for Mr. Big stuff who knows? Don't feel sad, all you gotta do is ask Ken to change your name to "fireman_lover"
If you want the PGMs back then demand Racer X!! The tour even birthed a new one!